ETIHAD Airways has announced it will acquire Mubadala’s Aircraft Technologies (Adat) following an agreement reached recently which also sees the setting up of a new engine company. The deal will see Mubadala retain Adat’s engine-focused maintenance, repair and overhaul (MRO) business and establish a new company focused on growth of the existing engine business. The deal enhances the UAE national airline’s capability to undertake airframe and component maintenance as it includes maintenance and engineering teams, hangars, component workshops, and paint facilities in Abu Dhabi. Etihad Airways has a growing fleet of modern aircraft, including the new Airbus A380 and Boeing B787, which will join the fleet in the last quarter of 2014. Engine MRO is set to form a significant component of Mubadala’s aerospace strategy, and the new engine company will form the foundation for this growth under the leadership of Abdul Khaliq Saeed, Adat’s current CEO. At the 2013 Dubai Airshow, Mubadala signed deals with Rolls Royce and GE Aviation to establish next-generation Trent XWB and GEnx MRO centres of excellence in Al Ain. This was further supported with a combined commitment of $1 billion in engine parts production from both manufacturers. Homaid Al Shemmari, chief executive officer of Aerospace and Engineering Services at Mubadala, said: “This acquisition by Etihad Airways is a true testament to Adat’s world-class MRO credentials and its exceptional workforce. “At the same time, we are establishing a new company to build on growth in this strategic sector focused on the engine business, following our announcements at the Dubai Air Show. 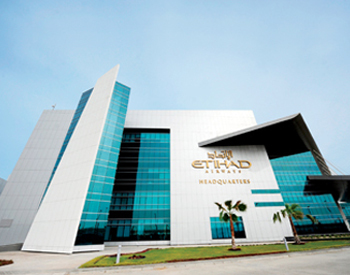 Jeff Wilkinson, Etihad Airways’ senior vice president, technical, will be responsible for the combined MRO of Adat and the daily technical operations business. A transition plan is in place as Etihad Airways continues to work closely with its new and existing employees and customers, ensuring that there is no disruption to existing services during the integration period.